This mural has since been painted over. 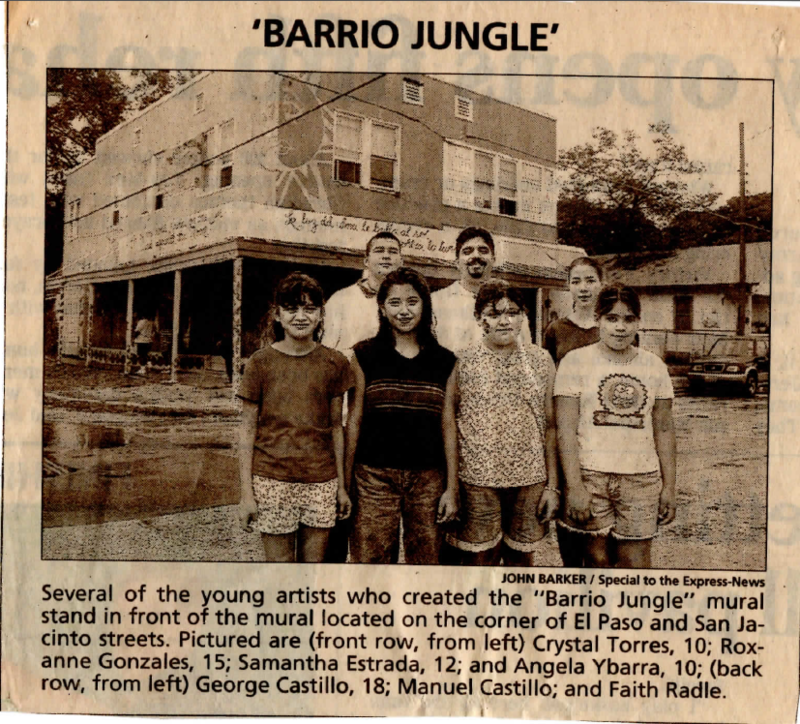 The mural blessing for Barrio Jungle drew press coverage from San Antonio Express News - see newspaper clippings above and to the right. At 12:00pm on October 11, 1997, San Anto Cultural Arts will announce its official birth as an independent non-profit agency after having been supported and nurtured by Inner City Development for the past three years. The announcement that San Anto has been granted official non-profit status will be made in conjunction with a mural blessing at the corner of El paso and San Jacinto streets. "People call our neighborhood a jungle. Well, I'm going to give them a jungle," said Cindy Magallanes, lead artist explaining the inspiration behind the mural. Her partners in creating this stunning mural were Mary Helen Herrera and numerous assistant muralists. Barrio Jungle features lions, a whale, a giraffe, and ants with umbrellas amidst plenty of greenery. The mural, Magellanes' first, was featured in the video "Mundo Sin Guitarras" by Tejano group La Diferencia. The celebration, which is free and open to the public, will feature poetry, music by the band Hispanic Conquest, Tip Top and his breaking crew, dance, food, and almost-guaranteed cooler October weather. People call our neighborhood a jungle. Well, I'm going to give them a jungle!"